Conservation group Italia Nostra (Our Italy) launched a campaign to challenge the approval of the project. This campaign deserves support because the conversion of this palace would mean part of Venice’s ancient heritage would be lost forever. Beppe Grillo’s 5 Star Movement has also opposed Benetton’s project. As explained in my book, Venice in Environmental Peril? Myth and Reality (UPA, 2012), Venice needs a great deal of infrastructure development but not modernisation that destroys vital parts of the city’s heritage. Alternative proposals for the use of this palace should be explored, including its conversion into a museum, art gallery or educational facility that would not require its total transformation. These alternatives could provide a new role for the palace, while preserving its historic character. Pardon me … As you know I love your book, and … I do not agree with your conclusion in this case. Benetton offered a very good compromise position and I say why not permit this use … It is one of the areas with the most tourist traffic in Venice anyway … Why not a Benetton Megastore inside? It would certainly add to the tax revenues more than another underutilized building owned and run by the government. It is time to think about being a bit more creative and explore what might be possible for the Venice of the future. It is important to get the public into these buildings, and using them for real 2013 urban spaces – retail! I welcome your comments because every case in Venice needs careful consideration. In this case, my principal objection is that an important historical building will be transformed into a shopping centre. I am against development when it results in the loss of significant historical heritage. As explained in my original post, this building has played vital roles in the evolution of the city. I would like to see a new role for it that also provides opportunities to reflect upon its previous roles. Changing it into a museum or gallery could incorporate reflections on its past. Turning it into a megastore will not. 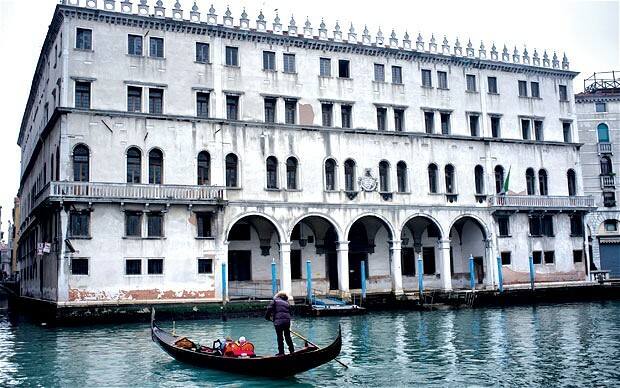 You mention that it could become another underutilised public building, yet Venice does not have one publicly funded art gallery in a city that has a wonderful artistic history. On the other hand, Venice has plenty of shops, including a large Benetton store and many luxury brand shops. Is there really a need for more clothing stores? You are right that selling the property to Benetton for retail development will bring more revenue for the City Council in the short-term. However, this will mean the loss of this important historical site forever. The short-term problems of the city’s finances should not be traded for the loss of heritage. This also applies to selling Venetian ancient palaces for their transformation into hotels, which I also oppose. Revenue for the city can be generated in other ways, as outlined in my book. Constructing Pierre Cardin’s Light Palace and the creation of a new Marriott luxury resort on Sacca Sessola island (announced today) are positive forms of development that can bring more revenue to the city. 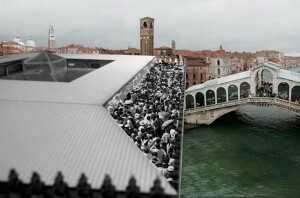 Ultimately, do we want Venetians and visitors to the city to have more cultural or shopping opportunities? Moreover, do we want to develop the city’s identity as a cultural attraction or a great place to shop? I couldn’t disagree with you more Carla Picardi: if “using them for retail” is the most “creative” way we can “get the public into these buildings” then God so help us for we are well and truly done for … If that is the best Venice City Council can come up with, they have clearly lost the plot as well as their collective imagination and evidently not up to the job. Frankly, we can do better, and Venice dererves better. “Moreover, do we want to develop the city’s identity as a cultural attraction or a great place to shop?” pretty much sums up the choice put before Venice City Council and sadly they have chosen the latter option, betraying the city’s cultural heritage and throwing away the opportunity to enrich the city’s future cultural development. For a city that increasingly laments the impact of tourism on its cultural identity and complains about “the wrong kind” of tourist “flooding” its shores, the council’s decision to allow Benneton to turn such an iconic building into a clothing megastore instead of developing it into a centre to attract the culturally curious, seems peverse in the extreme. Shame on the 18 who voted it through and shame on the three who lacked the courage of their convictions; they have sold part of Venice’s cultural heritage for a few pieces of silver and the city is all the more poorer for it.